London is not short of Italian chain restaurants. There seems to be a Zizzi, Strada, Prezzo or a Bella Italia on every corner, with many of the menus at these outlets being very samey. Wouldn't it be great if another, more genuine line of Italian restaurants started proliferating around the capital? Well, as it happens we are in luck, as one of the stars of South East London, Bianco 43, has opened the doors of its latest branch, and its right by Trafalgar Square. What could be more convenient? Bianco 43 claims to be London's 'most authentic Italian pizzeria' and they may well be entitled to do so. Serving Italian staples alongside delicious, doughy pizza, the menu has a solid range of pasta and an impressive meat and fish section, including a rather creative looking Italian beef burger, which proved sorely tempting before other choices won out. We chose the calamari and the bruschetta to start, both of which were very good, but the topping of the bruschetta only consisted of tomatoes, olive oil and garlic, and could have possibly benefitted from a few extra ingredients such as an onion to break up the flavour a little more. For main course we selected from the pasta menu and extensive pizza selection, plumping for the Gnocchi alla Sorrentina and the Cotto e Funghi (ham and mushroom) pizza. The gnocchi was baked beautifully in a tomato sauce and covered with balls of melted fresh mozzarella which you could have probably stretched for miles. 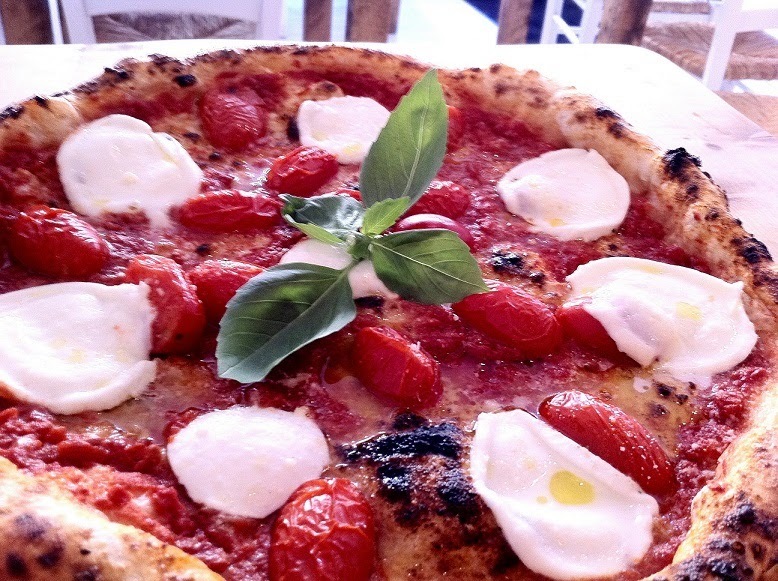 The pizza was reminiscent of the type you would expect to get in Naples and southern Italy. It was extremely thin and crispy, cooked very quickly at a high temperature in the stone oven, contributing to a feeling of freshness that came with every bite. It even managed to win over a staunch fan of the thicker American style of pizza, which is high praise indeed! For dessert we tried the Torta Con Crema al Cioccolato, which was sadly a bit dry for our taste, and the Fruttini, which despite its name, is not a colourful cocktail; ‘shells' of fruit and nuts had been scooped out, flash frozen and filled with similar flavoured sorbet. It was a very unique and attractively presented dessert: we wouldn’t have imagined that we would enjoy a nut sorbet! The main courses were all very reasonably priced, as were some of the starters. By contrast the dessert was a little overpriced, as undoubtedly delicious as the Fruttini was. However, it would be fair to expect that, if the right menu choices were made, that two people could easily enjoy a two course meal at Bianco 43 for about £30 before drinks. Not bad considering the price of a similar meal in one of the more prolific Italian chains, and even better when you consider the location. The rustic, home-made food seemed like it would be much more at home in a whitewashed, simple location in Greenwich, where Bianco 43 usually plies their trade, than in a marble pillared room with hanging chandeliers and a richly decorated ceiling just up the road from Whitehall, but any thoughts we had about the décor of the restaurant did not detract from the high quality of the food. The new Bianco 43 is definitely worth a visit if you feel your tummy rumbling after a trip to the National Gallery and similar nearby tourist destinations, and if you fancy some reasonably priced, top-quality, authentic fresh Italian food, but if you want the real trattoria atmosphere to go with it you might be better served by paying a visit to one of their two original venues in the south-east.